Pay to Play Politics in Rhode Island? BRISTOL, R.I.__ The 2014 midterm elections wrapped up on November 4th with a sweep by the Democratic Party of Rhode Island. Democratic nominee, Gina Raimondo beat Republican nominee and current Mayor of Cranston, Allan Fung, as well as the Moderate Party candidate, Bob Healey. Raimondo effectively claimed the title of the first woman Governor of Rhode Island, she also became the first Democrat elected to the office since 1992. 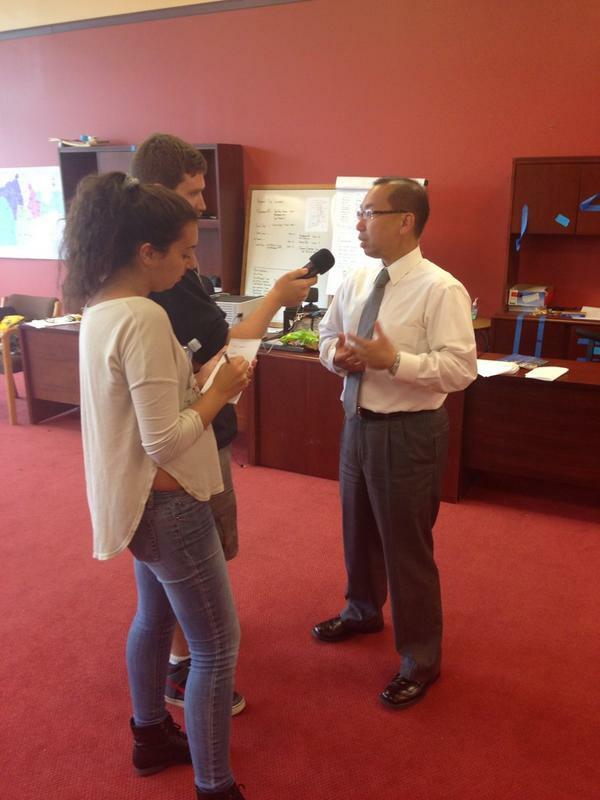 Former Republican Nominee for Governor of Rhode Island and Mayor of Cranston, Allan Fung, interviewed by reporters. With the Ocean State’s economy still reeling, both Fung and Raimondo, ran on the platform of restoring the great state of Rhode Island to its former glory- more jobs, a bolstering economy, better infrastructure. Rhode Island’s unemployment rate remains a staggering 7.7%, one of the highest in the nation. According to facts put out in September of 2013 by The Economic Progress Institute, Rhode Island boasts 144,000 people who were living in households with income below the federal poverty level, which was $11,900 in 2013. This is 14.3 percent of the population. Among the New England states, Rhode Island had the largest share of its residents living in poverty last year. These sobering statistics didn’t stop candidates from spending profusely on their own campaigns. In total, the original six candidates for Governor spent a whopping 15 million on the race, making this the priciest Governor’s race in the state’s history. Raimondo’s camp spent $5.4 million from the start of 2014 through Oct. 27, winning her 40 percent of the electorate on November 4th, as well as pushing her through the primaries. This would be an approximated $30.54 per vote. Fung spent $1.8 million through the year, or $13.86 per vote he got in the two elections.